Start reading Animal Spirits on your Kindle in under a minute. This book was designated as a "recommended text" for a graduate-level financial economics course. The reason being, of course, is that it offers an excellent overview of basic Keynesian ideas and introduces the uninitiated to behavioral economics; topics which are only briefly covered in the traditional economics coursework. Akerlof and Shiller are on the forefront of the behavioral economics movement and outline many key ideas of the movement in this book. They spend most of the book addressing the psychological motivations for the biggest economic crises in the US over the past century and give a refresher course in basic macroeconomics. Throughout their entire discussion, though, the most radical idea they introduce is near the end of the book. They suggest that in order to properly understand macroeconomics, it is essential to discuss the "special poverty among minorities." Or rather, that levels of inequality in a society influence the macroeconomy. This idea is illustrative of the authors' main point on the heavy influence of human psychology on the economy. They craft the argument that the conventional wisdom in economics is flawed because it does not take into account societal constraints and human behavior, which greatly influence the economy. The questions the reader is left with upon finishing the book are: 1. How can we properly include psychology in economic models? 2. To what extent is the government needed to establish the "rules of the game"? The authors emphasize the importance of these topics, but hardly provide prescriptive solutions. Overall, this is a well-written, well-argued book on the topic of behavioral economics and finance. Whether you agree or disagree with Keynesian economics, this text will definitely raise some interesting points. 4.0 out of 5 starsExcellent practical insights from top-notch academics. This book provides an excellent insight in the various elements of human behaviour into the financial markets. It brings together elements of academic studies from both authors and they have proven their worth in the financial and real estate markets (any type of asset). The concepts have a clear pragmatic element and with this book Akerlof and Shiller succeed in popularising their models and academic research. Somehow the reader is left with a feeling that they tried to fit the different parts into one book leaving the reader a bit puzzled when moving from one chapter to another. The book has a bit of an awkward feeling but that does not take away the valuable lessons and insights. By now the elements and details of financial crises of the last decade are fading into the past. The lessons, rightfully, should not and that is the true value of this book. 4.0 out of 5 starsWish to have read this book earlier! Well written book that shed lights on the economical issues from a macroeconomic perspective, with the notion of 'animal spirit' and how it influences a person's thinking in common business activities. Wish to have read this book before actually pursuing my MBA degree, nevertheless it left unconventional thoughts that wouldn't be taught in a classroom. What Keynes means by 'animal spirits' is made a lot clear by the authors. They identified five types of human mental states that constitute animal spirits in humans. 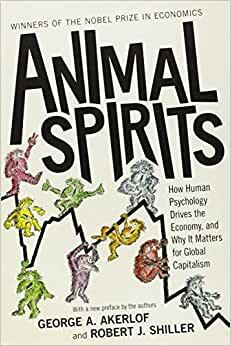 The notion of animal spirits is particularly useful in explaining the boom-burst cycles in capitalism and rampant corruption in autocratic states. However, for the sake of completeness, I think the authors should endeavour to embed the concept of animal spirits in human self-interest so that the discussion is more in line with mainstream economics.